Buy and earn 1,100 points valued at £11.00. 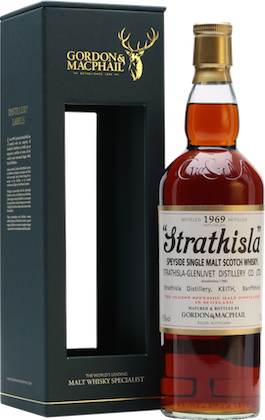 A long aged bottling of Strathisla from independent bottling veteran Gordon & Macphail. Distilled in 1969 and was bottled by Gordon & MacPhail, Strathisla is one of the oldest distilleries in the Highlands. Aged at over 40 years old, this Strathisla is packed full of sherry fruit and spice. Nose: Delicious rich christmas cake aromas - full of currants, raisins, brown sugar and mixed spiced combined with candied orange peel and marzipan. Palate: Even fruitier with notes of pineapple and mango with wood smoke drifting on top. Finish: Long with spice and subtle peat smoke.